This article originally appeared in the 29th Annual Tri-State Pottery Festival Plate Turner's Handbook. June 20, 21, 22 1996. By the last years of the Nineteenth Century, the United States was enjoying the results of its industrial growth and for the first time began to take a leadership role in international affairs. Some historians have compared the situation to that of an adolescent flexing his muscles and looking for an excuse to use them. In an age of imperialism, a major power had to obtain and hold foreign territories but there were few worthwhile lands that were not already within the spheres of the major European powers. Only by taking the place of one of the existing powers could the U.S. become a first-rank nation - as perceived by the rest of the world. Too tempting to resist were the possessions of the fading Spanish empire, which was having considerable difficulty both financial and military at holding its far-flung possessions left over from the days of the Conquistadors. The native population of Cuba had been in insurrection against their Spanish lords for several years and many Americans, especially the press, were anxious to oust the Spanish and liberate the Cubans, although under American leadership. A purportedly friendly visit by the U.S. battleship Maine would prove to be the ignition point to smoldering American resentments that lacked only some justification to initiate armed conflict. On February 15, 1898, while peaceably anchored in Havana harbor, the Maine mysteriously exploded with the loss of more than 200 lives. American war fever was mirrored in the pages of local newspapers. Within days of the Maine disaster, local opinion was firmly on the side that believed that Spanish treachery had caused the explosion. At least one aged Civil War veteran, Henry Steirjohann, who had served on naval blockade duty, offered to re-enlist in an article headlined "Will Go to War Again". While the nation roused itself to go to war, and the Spanish insisted on their innocence East Liverpool prepared to send its contribution in the form of Company E, Eighth Ohio National Guard. First formed in the early 90 s, Co. E's only prior active service involved several weeks of duty along the railroads of Belmont County during the bitter coal field strike of 1894. By April 21, an order had been issued to prepare for active duty. An actual declaration of war by Congress would occur four days later. 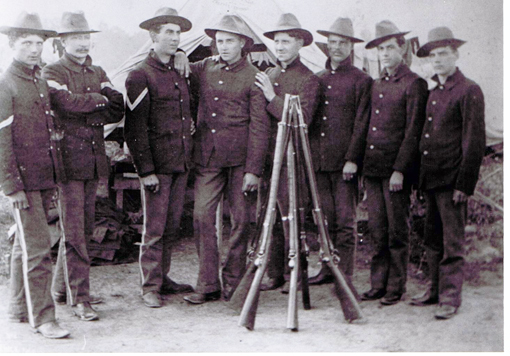 Vacancies in the ranks were quickly filled with new volunteers and Dr. Hobbs examined the men. One group of new enlistees included 11 potters, one laborer and one baker. Captain William Hill was in command of the Company and would remain so for almost,,twenty more years. On April 22nd, the "Evening News Review" gave front page coverage to the local activities under the headlines "War is Now Actually at Hand"., The article described an impromptu parade of Capt. Hill and his 75 volunteers complete with musical accompaniment by the Manley band. The next day's paper announced that the First Presbyterian Church would present each man with a pocket testament. Religious matters were again in the news on April 25 when the entire company heard a "strong sermon" delivered by the Reverend Dr. Lee. 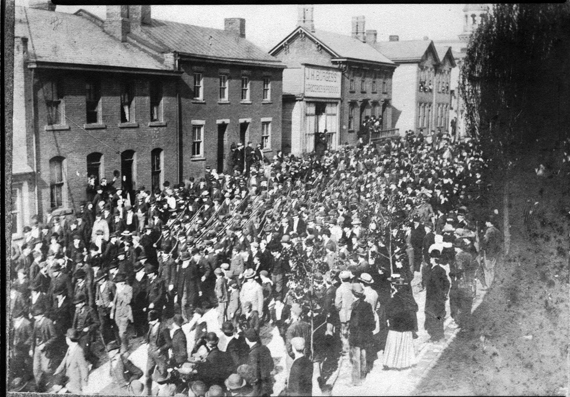 That evening another public spectacle was available and observed by crowds estimated at 10,000 strong when former Col. Harrington R. Hill, who had led a local company during the Civil War, presented a new flag to his son, Captain William Hill ,on the steps of the First National Bank. One reporter described the activities as "without question among the most enthusiastic and exciting in the history of the City". 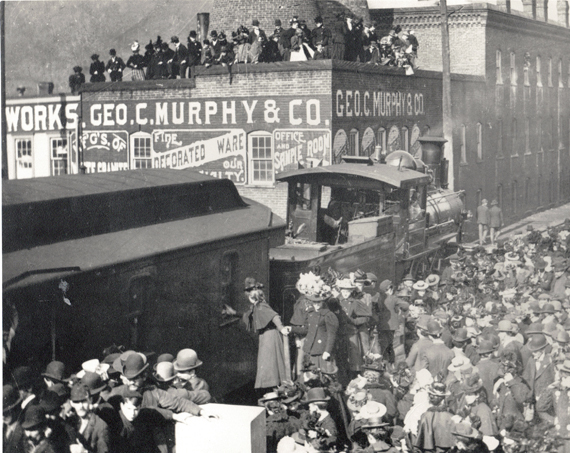 After the flag presentation the company marched along Third Street to the station while thousands lined the streets and cheered. The bands played such traditional favorites as "The Girl I Left Behind Me" and, at the station, "Hail Columbia". After a salute fired by the Sons of the Veterans the men departed for camp in two rail cars. Co. E. of the Eighth Ohio National Guard passing down Third St. on their way to the train to Akron and Mustering in. Photo from the collection of Charles R. Thomas. Co. E. 8th Ohio Entraining for Akron, Ohio for mustering into U. S. Service, April, 1898. 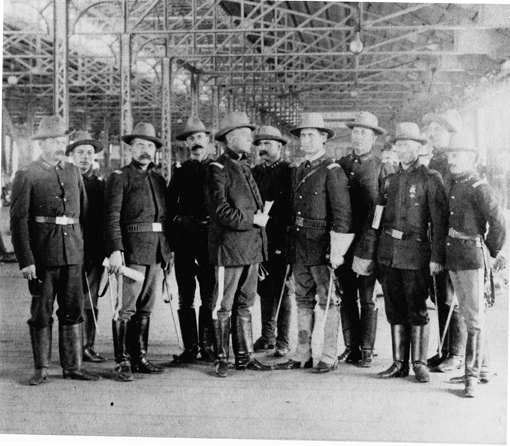 After the companies joined from the various parts of the state, the Eighth Ohio spent several weeks at Camp Russell A. Alger, not far from Washington, D.C., where their organization and training were improved. On July 5th, 1898, the regiment moved to New York city by train and there boarded the USS St. Paul for the voyage to Cuba. Co. E, 8th Ohio. Extreme Left: Cpl. William R. McCord, next Sgt. George T. Blake, Cpl William J. Miller, Pvt. Frederic A. Smith, Cpl. Ralph A. Wood, Pvt. Robert N. Taylor, Pvt. Carl D. Teeters. Cpl. Walter S. Cook. Camp Alger, Washington D.C. Colonel Hard and Staff, 8th Ohio, Vols. On pier N.Y. Sailing day for Santiago. Not withstanding the grand send-off they had received in East Liverpool, Company E and the 8th Ohio were not destined for military glory., assuming such a thing exists. 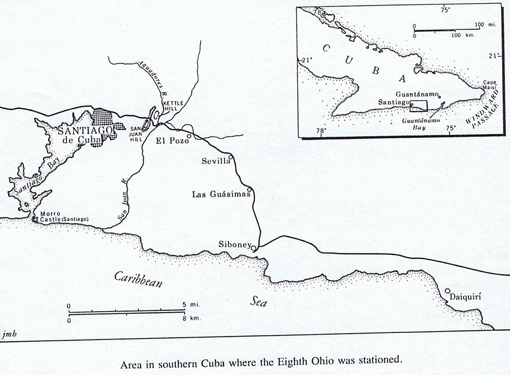 The regiment splashed ashore at Siboney, on the south coast of Cuba as part of the forces gathered to lay siege to Santiago de Cuba on July 11, 1898. Their arrival occurred a little more than a week after the Spanish fleet had been destroyed and subsequent to the severe infantry fighting known to history as the Battle of San Juan Hill. The entire service of the Eighth was spent in camp and in the trenches awaiting the surrender of the Spanish forces defending Santiago. While Spanish shells and bullets claimed no lives, the tropical ,fevers of the Caribbean proved a dangerous adversary. Malaria and typhoid fevers appeared and deaths soon resulted in the Eighth. Co. E was fortunate to lose none of its members prior to embarking on the SS Mohawk on August 17, but many of the Company who boarded were gravely ill. The first Co. E fatality occurred on board the Mohawk when Pvt. Okey J. Eddy died on August 22nd and was buried at sea. Four more of Co. E's privates would die of their illnesses. 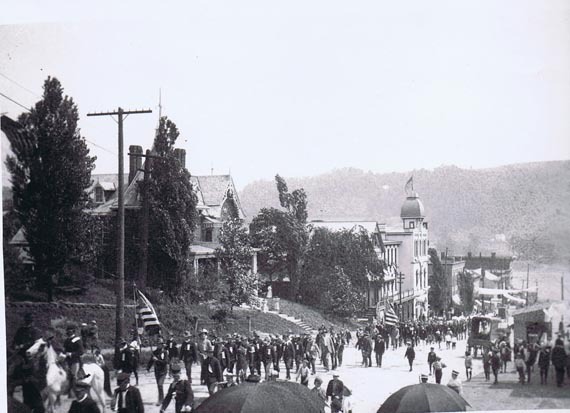 On the return of the Eighth to the U.S. the people of East Liverpool sent a delegation of doctors, citizens and supplies to benefit the local boys who returned in much worse condition than they had departed. 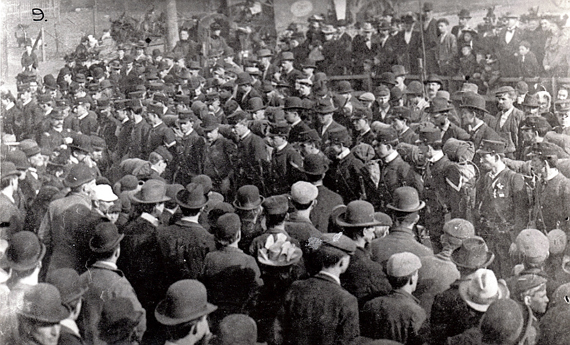 The men were given furloughs to their homes on September 6, where they remained until summoned to Wooster, Ohio where they were officially mustered out on November 21, 1898. Return of Company E. O.V.I. Date about Aug. 15, 1898. Company E was landed on Montour Point, Long Island, NY. No "delousing" at that time.